Top up from €10-€250 instantly. Activate card online to access funds. Use at 30 million locations worldwide and online. Not restricted to certain stores or a particular shopping centre. 2. Where can I get a SWIRL Gift Card? At any of the participating Payzone outlets nationwide. Online by clicking the "Get a Card" button on our homepage. The Gift card can be delivered to your address or directly to the recipient. 1. How can I top up a SWIRL Gift Card? The agent will swipe the Gift card through their terminal and enter the amount you wish to load (max €250). Pay the agent the cash plus the top up fee (€2.99). The agent will print a receipt to complete the transaction and the funds will be topped up onto the card instantly. Enter the amount you wish to top up by (max €250). You will incur €2.99 postage & packaging fee. Complete your order. Funds will be topped up once the Gift card has been activated online. 2. Can I top up a SWIRL Gift Card online? Only SWIRL Gift Cards ordered through our website can be topped up online. This top up must be completed when making the order. You won't be able to top up the card online after you have received it. If you pick up a card at a Payzone outlet you will only be able to top up in cash. 3. Do I need to register and how do I register a SWIRL Gift Card? Prior to registration you can load the SWIRL Gift Card up to €250 instantly. To spend these funds the card must be registered online at www.swirlcard.com. Once this has been done your funds will be available to spend online, in-store and over the phone straight away. * Your name, address, date of birth, place of birth, email address and phone number. Alternatively, you can register by calling our helpdesk +353 01 6877 985 where one of our helpful Customer Service Representatives will complete the online registration form on your behalf. Please note: the SWIRL Gift Card can only be topped up once. However, if you would like to continue using the SWIRL card service you can purchase one of our SWIRL reloadable MasterCards. Please ensure that you enter your Customer Number on the registration page. This can be found on the back of your Gift Card, in the bottom right hand corner. You may have registered another card previously (if so please refer to point 1). €3.50 per month after 12 months of inactivity. This fee only applies to cards with a positive balance. When you get a Swirl Gift Card you can load up to €250 instantly. No registration is required at this stage. To access the funds the Gift Card must be registered online at www.swirlcard.com or by calling our helpdesk on 01 6877 985. Valid details must be provided on registration. Once this has been completed your funds can be spent online, in-store or over the phone straight away. 7. Who can get a SWIRL Gift Card? Anyone over the age of 16 permanently residing in Ireland can get a Swirl Gift Card. You don’t need a bank account and we do not require any information on your credit history. Your SWIRL Gift Card can be used at over 30 million locations worldwide. Paying by card is a safer option than carrying around cash and a more secure way to shop. 16 Digit Card number: Found on the front of your MasterCard. CVV code: The last three digits on the signature strip on the back of your card. Cardholder Name: The person the card is registered to. 2. What codes and pins do I need to use the SWIRL Gift Card? The SWIRL Gift Card is a swipe and sign card so you won't need any pin code when making purchases in store. The merchant you are purchasing from will swipe your card through their terminal and you will be asked to sign for your purchase. Merchants may also require some form of photographic identification (passport/licence) before accepting your card. Customers should ensure that they have written their signature on the back of the Gift Card. 3. Is there anything else to consider when using my SWIRL Gift Card? Customers should note that a 15% tip provision applies to payments made through service terminals. This means that you must ensure that 15% of the original transaction value is available to cover this provision. Please note that only the original transaction amount will be charged to your card. However, the transaction will not be authorised unless the 15% is available on your card in the first place. These type of terminals are most commonly used in hotels, restaurants and for ticket booking services. However, we have also seen them used by the Taxi Regulator and the NCT Centre. A pending transaction is a temporary charge held against the available funds on your account. It relates to an approval issued by the bank in response to an authorization request sent in by a merchant. The transaction is in a pending status until it has been cleared (or settled) by the company in question. Typically transactions are cleared at the end of each day. In all cases, pending transactions relate to purchases or withdrawals that have not been settled. 4. The authorisation code of the transaction. Please forward this email to the Helpdesk on info@swirlcard.com or fax (0353) 45 898798 with your Customer Number in the subject line. Once we receive this information we will immediately forward it onto our issuing bank to request for the transaction to be cancelled and the money returned to your account. If the email provides sufficient evidence that the transaction has been cancelled by the merchant then the bank will cancel with pending within 24 working hours. Please note: the bank reserves the right to refuse to cancel a pending transaction if it believes that the information provided by the merchant is not sufficient. For further information please contact our Customer Service Helpdesk on 0203 0262 641. Some companies may use 3D Secure when processing online transactions. Unfortunately there is no 3D Secure available on the SWIRL Gift Card. In most cases if a 3D Secure password is not entered the company will bypass this part of the process and accept payment from the card. SWIRL Card accepts no liability for any company who refuses to accept the card without this password. With Swirl you can access the past 18 months transactions from your online account. Simply log into your online account and click on “View recent transactions”. Your transactions will automatically be displayed on the screen. If you have a query in relation to a transaction on your account or require a full transaction list please contact our Customer Service Helpdesk on 01 6877 985. To reset your password for your SWIRL Gift Card account please click on the "Forgot Password" link on the login page. You will receive a link to reset your password to the email address you provided on registration. You will also receive the link by SMS. Once you have reset your password you will be able to log in using your Customer Number and new password. If you experience problems resetting your password please contact our Helpdesk on 01 6877 985 and we will be able to reset the password for you. Please be advised that we can only reset the password for the card holder. 1. How much does it cost to get a SWIRL Gift Card? There is no cost to purchase a SWIRL Gift Card, however, a €2.99 fee does apply when topping up in-store or ordering online. 2. Are there any other costs involved? Dormant account fee €3.50 per month after 12 months of inactivity. Only applies to cards with a positive balance. If your card has been lost, stolen or damaged immediately call our Customer Helpline on +353 (0) 1 687 7985. Our customer service team will do their best to protect your money and advise the best procedure for each customer’s case. Alternatively you can access your online account 24/7 and suspend your card. Your card will be automatically blocked to secure your funds. To do this, log into your online account and select “Suspend Card” and click “Suspend”. Once the card is suspended you will need to call our Helpdesk to cancel the card. You will then be able to get a new card and re register. From there we can transfer your old balance to your new card. 2. When will the SWIRL Gift Card expire? The expiry date printed on the front of your Gift Card is the date until which the card can be topped up. Once your Gift Card has been topped up it's valid for a period of two years from the date of that top up. 3. How do I replace my expired cards? Once your Gift Card has expired you can get another one either online or in a Payzone outlet. Alternatively you can purchase a SWIRL reloadable MasterCard that you can continue to top up and use. Any remaining balance from your expired Gift Card can be transferred across to your new SWIRL MasterCard for you. 4. How do I withdraw my balance if my Gift Card has expired? You can get a new Gift Card pack from your local Payzone agent or order online for direct delivery. Once registered, we can then proceed to transfer your funds to your new card. Alternatively you can purchase a SWIRL reloadable MasterCard if you wish to continue topping up and spending. Any remaining balance can be transferred from your Gift card to your new SWIRL MasterCard for you. 5. How many Swirl Gift Cards can I have? You can only have one Gift card registered to your name at any time. You can have up to three cards in a life time and up to 4 cards per household*. If you require more information please contact our Customer Service Helpdesk +353 (0) 1 687 7985. 6. What countries can I use the card in? You can use your SWIRL Gift card to make payments in any country that MasterCard is accepted worldwide. 7. What happens if there are transactions on my account statement that I do not recognise? If you notice transaction on your account that have not been made by you we would firstly recommend that you try to contact the company and check the transaction with them directly. If the company are unable to provide you with any information please report the transactions to our Customer Service Helpdesk where our representatives will investigate. You may be required to fill out a chargeback form including: date of transaction, customer number, dispute amount and currency, reason for your dispute. Upon receipt, our Issuing bank (Catella Bank) will start investigation. Your Gift Card will only be credited after successful clarification with the merchant. 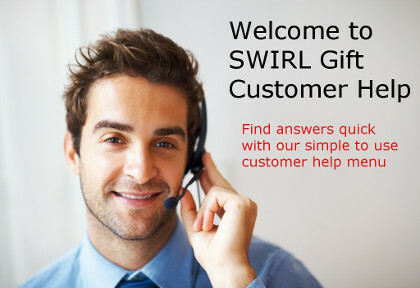 SWIRL Gift Card provides a Customer Helpdesk Service where you can direct your questions and queries. The customer helpdesk can be contacted between 9am and 5:30pm Monday to Friday on +353 (0) 1 6877985. Our friendly and helpful team will require you to have your Customer Number ready and be able to confirm your details. We will never ask you for your MasterCard number. These details should never be revealed to anyone for security reasons. For non-urgent requests and queries you can email our helpdesk on: info@swirlcard.com or use our Live Chat service where our Customer Service Representatives will be ready to help. 2. How can I cancel my Gift Card? +353 (0) 1 6877985 where our representatives will ask you to confirm your name and date of birth and the reason for cancelling your card. There is a €15 redemption fee for cashing out remaining funds on the account so we would advise you to spend your balance before cancelling your card. 3. How can I obtain remaining funds if I cancel my Gift Card? We recommend redeeming the remaining funds by using up all available funds in-store or online Additional information is available in the Terms and Conditions on our website. There is a €15 redemption fee for cashing out remaining funds on the account into your bank account.